Beautiful piece, well made, decorative pillows were included which I did not know so bonus. Looks even better on my patio than on the pictures. Easy storage for the winter (all cubes). I will recommend it, I have kids and neighbors kids are coming over and the set survived the kids! Bring a hint of seaside luxury to your backyard with this elegant and versatile 8-piece outdoor sectional sofa set by Corvus. 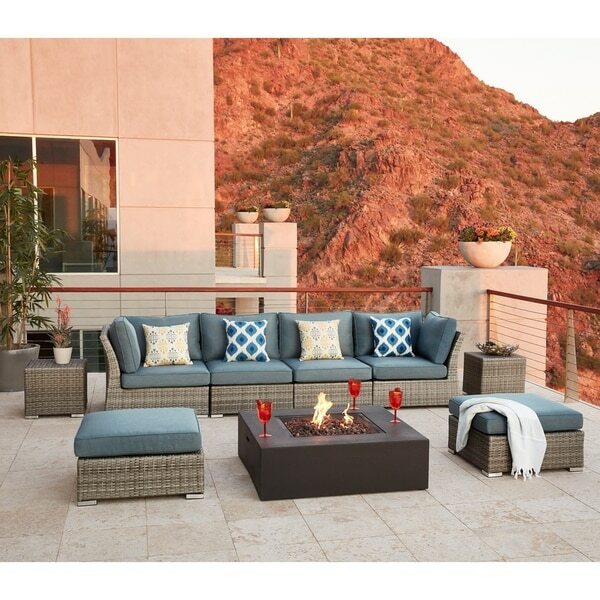 Crafted with lightweight and durable aluminum frames with woven grey resin wicker that's weather and UV resistant, each piece features a low profile with cushions that add a comfy, casual character to the premium design. As practical as they are stylish, each piece is easy to move, allowing you to rearrange and reconfigure the set in the arrangement that will best fit your space. Dimensions 70.0 In. X 35.0 In. X 29.0 In. You don't always get what you pay for!! Love the look the cushion color is really nice- muted, denim-like, but.... the wicker under the seat cushions sag. Needed to cut some plywood to fit so couldn’t be seen, and now it is great. Was a lot of work to make them comfortable though. This set is far to low to the ground and the cushions continually fall of nothing to secure them to the wicker. I hate it!!!! This set offers a small set that is attractive and comfortable for a reasonable price. Is it a set that will last decades? No. While the frame is sturdy, the center of the seats are not reenforced, so they will eventually start to sag like the vinyl folding chairs. 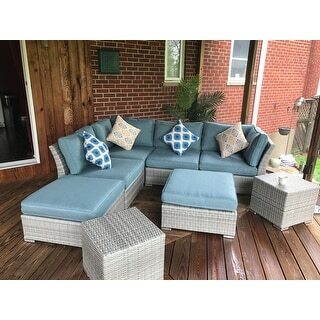 Still, I would recommend this set for an affordable addition to a porch or patio. I fell in love with this set online and was not disappointed when it arrived. The colors, and quality are exactly as pictured. The cushions are a little stiff but hopefully they soften up a bit over time. I love that there was no assembly required when I opened the box. The wicker appears to be very durable, but I just received them so I will need to provide an update once I've had them for a while. I took other buyers advice and Scotch Guarded all the cushions to prevent extreme water absorption. I did notice that the cushions get pretty hot in the Texas heat so you might want to put a beach towel down over the cushions before you sit on them in the middle of the day. Great patio set, on a smaller side but it's perfectly fits our space outside. I would agree with comments below about set being too low. It's fine with us, but I could see how it can be a problem for someone else. Also cushions are sliding, and material is a bit tough but I still love this set!! It looks very cozy!! I’m so happy with my purchase! It was so surprising that all 8 pieces came in 2 boxes!! I thought surely something was missing, but it wasn’t. This is a fairly low profile set with lovely blue/gray cushions. It is quite light weight and easily reconfigured when desired. I’m just setting this up so I’ve not yet unwrapped the cushions which came so nicely wrapped. This was a good value and a clean modern look. I’d recommend this to anyone. The set itself is fantastic, low profile, removable cushions. The shipping was not as expected. If you are expecting "white glove" service you won't get it. The item was 3 days late, not great but acceptable even though I wasn't able to track the order, just said in transit. The company called the day before it was due and said it would arrive the next day to the warehouse and to us the day after, didn't hear from them until late the 3rd day. It arrived the next day in a four hour window, they didn't call when they were on the way so you are stuck sitting around. The boxes were left on the patio, not unpackaged and they simply refused to wait until we unpacked so they could take the huge boxes as promised. They wouldn't take the boxes and just left. As they were leaving through the back gate they called out to us saying don't forget to close it. Seriously they were walking through it and couldn't close it behind them?!? So all in all we love the set but the shipping made the experience not as great as promised. 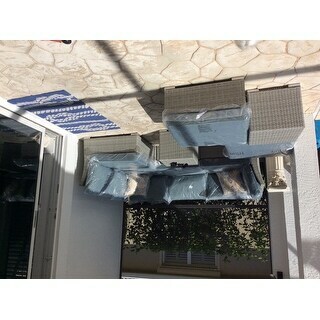 I love this patio furniture. The color is like the picture and I think it's of good quality. However, I was expecting the cushions to be thicker and with the possibility to secure them on the frame with some kind of straps. But I love our new set and planning on using it a lot during this summer and more. 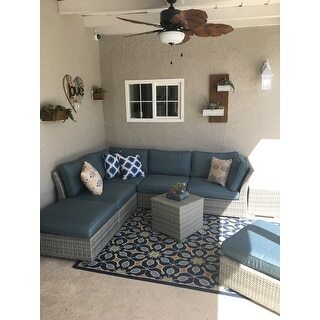 We got this set for our back patio after looking at many others; I love the color combination, quality and also the fact that the set can be configured multiple ways, making it a perfect fit for us. Everyone is always very comfortable on it! Exactly what we were looking for. So many different options for setting up different ways. Wasn’t crazy about the decorative pillow that came with it so bought new ones. It does sit low as other reviewers have mentioned, but I like it. The set is one year old and a couple of the cushions have torn at the seam. That's disappointing. 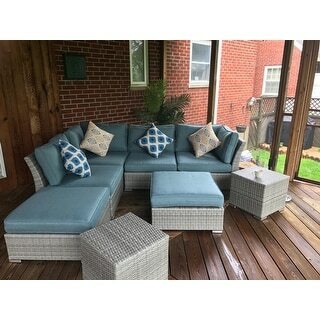 This is a beautiful set, I loved the configuration and the color and the price. I have had it a little over a year now and the cushions have ripped a little bit, but because I live in an area where the sun beats down on it alot I think that may be unavoidable. Overall I am happy. 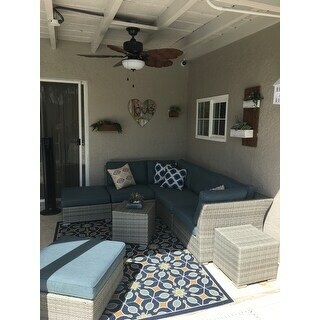 Love this outdoor set! We get a lot of compliments! Beautiful furniture. I love the color. "These colors are hard to pick. What color wicker is with the darker blue cushion and what color wicker is with the grey cushion?" "Are the small pillows included?" "I'm getting ready to order and I would like to get the grey cushions. it shows that's an option in the description, but in my checkout it shows as the denim blue? can you help me get the right one? I do t see a dropdown for the colors." They are blue like the photo. Unfortunately I believe that if it is not a selection it is not available. I have the beige with blue and that is how i ordered from overstock. It is exactly as pictured. "Are the cushions waterproof or do they need to be kept out of the rain?" We would recommend you store the cushions indoors when it rains so you can keep them clean and new. "Can you identify which carpet that is in the image?" "How long did it take to arrive? " "How do the seats stick together? Are there clips/attachments? " The set comes with connecting clips to fasten the pieces together and keep them in place.